At first glance, wellness programs seem to only benefit employees, who may be able to take advantage of free or reduced gym memberships, health screenings, and more. In reality, wellness solutions can be incredibly beneficial to your company, leading to greater fellowship and productivity among employees, reduced absenteeism, and even lower insurance costs. Improving employees’ health and well-being through wellness solutions can have numerous benefits to a company’s bottom line. Numerous studies have found that a well-designed employee wellness program can produce a return of two to three dollars in reduced medical costs and absenteeism for every dollar spent. Johnson & Johnson found that it has saved more than 250 million dollars in health care costs alone from 2000 to 2010 through its wellness solutions. While J&J is a massive corporation, these savings can be seen in companies both large and small through the implementation of smart employee wellness programs. Wellness solutions or initiatives can take almost any form. In some businesses, it can be as simple as dedicating space for a small gym. For larger companies, it may mean building walking trails on its property, offering regular health screenings, or even incentivizing health or fitness goals. The key to a successful wellness solution program is to thoughtfully design and implement a plan that is both feasible and effective based on your company’s needs. A benefits consultant can work directly with a company or its human resources department to put together a wellness program that is designed to maximize both employee health and cost savings. For a program to truly have an impact, the business as a whole must demonstrate a commitment to wellness solutions — including company owners and executives. This often means taking time to put together a comprehensive program rather than a one-time event or irregular health screenings. A benefits consulting firm can work with a business to survey employees to determine the wellness solutions they want most and draft custom communications so that employees are aware of all of the options available to them. If your business is contemplating wellness solutions to boost employee health, there are many options to consider, such as an on-site fitness center, reduced or free gym memberships, or programs to help employees stop smoking or lose weight. It may also include more innovative ideas, such as offering flexible work arrangements to reduce employee stress, longer lunch breaks for employees to work out, giving employees pedometers to encourage them to take more steps each day, fitness or weight loss competitions, or providing healthy snack or meal options. The key is to plan the program in such a way that employees are aware of these options and are incentivized to take advantage of them. A poorly-designed wellness solutions program will ultimately not reap benefits for either your employees or your bottom line. Reduced absenteeism is a somewhat obvious benefit of workplace wellness solutions. Employees who are healthier tend to get sick less and as a result, require fewer sick days. This applies to both absence and tardiness due to chronic health issues as well as sick days that are related to injury and illness. Certain types of injuries cause the majority of workplace absences. According to the Wellness Council of America, approximately 100 million workdays are lost each year due to lower back problems. A wellness solution that includes initiatives designed to help employees lose weight and strengthen their muscles can reduce the probability of workers hurting their backs — and needing to take time off of work as a result. Beyond injuries, illnesses such as the flu or even colds can lead to high employee absenteeism, particularly in the winter months. A wellness program that educates employees about staying healthy and provides flu shots can decrease absenteeism, as employees may be less likely to get sick due to these measures. Countermeasures like these may also reduce the risk of infecting other workers as the employees will understand their symptoms and know to stay home to properly treat their illness rather than come to the office. Chronic health problems can often be improved through wellness problems. Employees who exercise regularly or lose weight may see a decrease in their symptoms or their need to seek treatment or take prescription medication. This can reduce their need to take off work to deal with their chronic health issues as well. When employees are healthy, their ability to concentrate on their work increases — which makes them far more productive workers. Employees who come to work feeling their best are more likely to get more work done and to do higher quality work while in the office. Employee productivity can go down for any number of reasons, including being stressed about health or other concerns, such as family issues or money. Exercise is a proven method for reducing stress, so companies that offer ways for employees to exercise at work or at a reduced rate outside of work often find that their workers are less stressed and therefore more productive. Companies that offer flexible work schedules also tend to see increases in productivity and work quality, as employees are less focused on outside issues, knowing that they will be able to address these matters when they are not at the office. Beyond the impact of stress and sickness on productivity, employees who do not feel valued are less likely to be highly productive while at work. Wellness solutions are one way to show employees that you care about their health and happiness. When employees are offered perks and incentives such as wellness programs, companies often reap the rewards in the form of employees who are more focused and provide high-quality work. An effective wellness program can also help to reduce employee attrition rates because their workers are both happier and healthier. Companies with well-designed wellness solutions often find that their voluntary attrition rate drops dramatically to single digit numbers. Reducing attrition ultimately decreases recruiting and training costs, making this incredibly beneficial to businesses. In 2016, the Internal Revenue Service confirmed that employee wellness program benefits are taxable to employees. 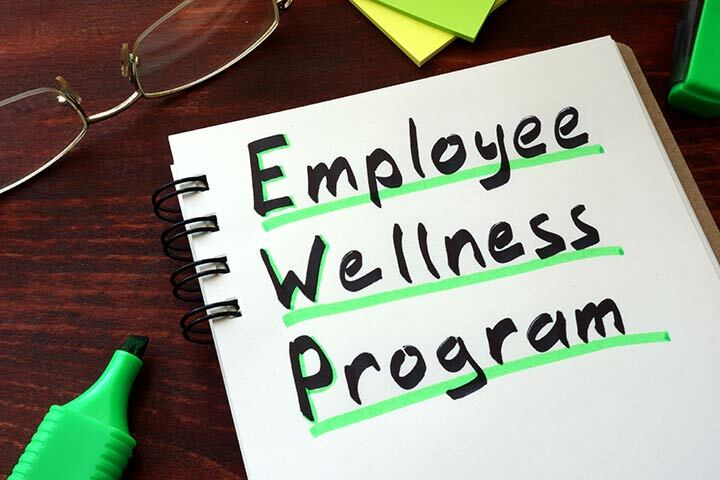 While this guidance is not favorable to workers who participate in wellness solutions, employers are often still able to take advantage of tax savings for these programs. As a general rule, a company’s costs in funding employee wellness solutions may be deductible from their federal taxes. The deductions are taken in a similar manner as any other employee perk. In addition, some states offer specific tax credits for employee wellness programs. Check with your state government to determine if these tax credits are available and if your program meets the eligibility requirements. For many small and large companies, the biggest benefit for employee wellness solutions comes in the form of reduced health care costs. Employees who are overweight or inactive tend to cost more per year in both healthcare claims and premiums. Wellness programs that help employees meet goals such as improving their fitness, losing weight, or stopping smoking can have a significant impact on a company’s healthcare costs. Numerous studies of companies that have implemented wellness programs have demonstrated that these solutions result in significant cost savings for health care. One recent study from Rand found that wellness solutions that included disease management components saved one Fortune 100 corporation 136 dollars per month per employee, plus a 30% reduction in hospital admissions for employees. Other studies have shown that employees who lose even a small percentage of their body weight (one point on the Body Mass Index or BMI scale) can reduce healthcare costs for them and their employers by as much as $1,500 per year. Workers who are in good physical health may also suffer fewer workplace injuries, leading to fewer workers’ compensation claims and lower overall costs. Keeping healthcare costs low is a benefit to both employers and employees. Workers have reduced financial stress when their premiums do not increase, which can contribute to increased productivity and quality of work as well as reduced absenteeism and attrition. Employers benefit from reducing their total expenditures, allowing them to realize greater profits and continue to grow and expand their business. When crafting a wellness program for your employees, it is essential that you implement an effective plan to take full advantage of the potential cost savings and benefits. A benefits consultant can work directly with your company to determine which initiatives will provide the greatest return on investment and the maximum advantages for your employees. By analyzing your employees’ needs, the cost and availability of various programs, and the feasibility of implementing various programs, a benefits consultant can help you design an employee wellness package that meets your company’s needs. The consultant can then work directly with your business to ensure that employees understand the options available to them through a range of custom communication options. Contact us today to learn more about how your company can establish an employee wellness program.